William McFaddin, County Pioneer and Texas War for Independence Veteran, started a private graveyard for his family as well as relatives and friends on some of his land that rested on the highest knoll in Beaumont overlooking Brakes Bayou back in the 1840’s. The first recorded burial was made in 1847 when John D. Gilbert was laid to rest. The first recorded burial on the McFaddin plot was William’s son John Andrew McFaddin killed at the battle of Fordoche Louisiana during the Civil War on September 29, 1863. During the 1860’s another burial area adjacent to the McFaddins was marked for the Odd Fellows Lodge. Then once again shortly after the reconstruction of the South, William saw the need for another addition to the hill so that other Southeast Texans would have a place to bury their loved ones. 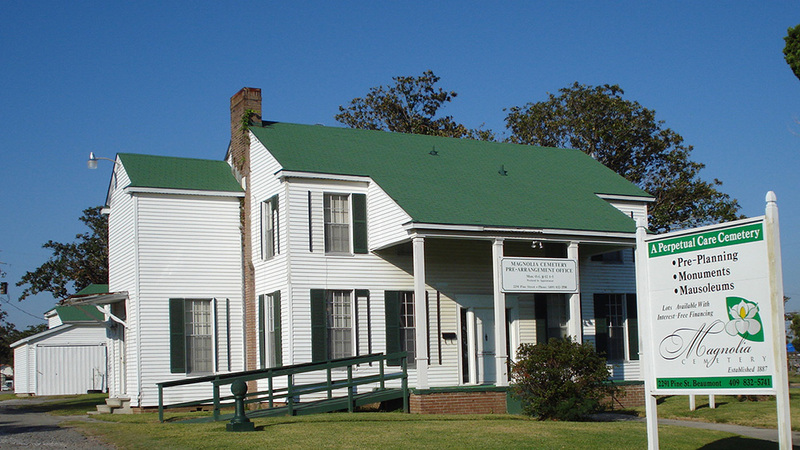 He deeded two and a quarter acres of his land that was adjacent to his private graveyard to the town of Beaumont in 1876 and was used in the beginning primarily for civil war veterans and their families. Many people rest on the hill including another Texas War for Independence veteran, union soldier, deputy sheriff of Beaumont killed in the line of duty on September 25, 1881, and many victims of the Great Flu Epidemic of 1918. In 1887 some of the prominent citizens of Beaumont gathered together to form a Corporation for benevolent and charitable purposes under the General Laws of the State of Texas. The purpose was “to purchase, improve and subdivide land and grounds for a private cemetery for the citizens of Beaumont and vicinity, and the future maintenance of the grounds by the sale of lots and otherwise as shall be the By- Laws prescribed.” The Corporation was to have five Trustees as the Board of Trustees for the first year, with the five being named as Valintine Wiess, Edward L. Wilson, A.S. John, H.W. Smith and John L. Keith. The Corporation issued capital stock in the amount of ten thousand dollars, divided into four hundred shares of twenty-five dollars each. This Charter application was signed by E.L. Wilson, A.S John and V. Wiess. The Charter was approved by the Texas Secretary of State, August 3, 1887. The Trustees of the Company then went back to their friend William McFaddin to purchase an additional thirteen acres needed to start what is now known as Magnolia Cemetery. In the years 1903 through 1906 the Corporation repurchased the stock sold, and began to operate as a Non Profit Organization. Then, under the leadership of V. Wiess, John N. Gilbert, P.H. Wiess, J.L. Keith and W.P.H. McFaddin, an amended charter was recorded May 9, 1924. The new charter states that the Corporation shall have no capital stock. Members of said Cemetery Corporation and stockholders therein shall have no financial interest in the assets of said Corporation. No dividend of any character shall ever be declared for the benefit of the members or stockholders. All income shall be used exclusively for the maintenance, upkeep, and improvements of the property and the purchase and improvement of additional property as required. As the years have passed Magnolia has continued to expand through land acquisitions from houses, schools, churches and one steel mill to meet the community’s needs. Today here at Magnolia we are still governed by a prominent board though their titles have changed from trustees to directors. We continue to purchase and develop additional acreage as needed. A recent purchase was the Maple Groves Baptist Church where our Serenity Mausoleums stand today. The first structure was built in 1998 and the second building was erected in 2005. We currently have about two hundred fifty crypts available for entombments. Our latest expansion was the purchase of land originally used for the Pipkin School, named after Woodson Pipkin, a pioneer in the education for African Americans. The expansion includes four sections named Garden of Hope, Garden of Peace, Garden of Faith and Garden of Valor, our veterans section to honor those who have served their country. One part of the development is reserved for future development. Lots became available for sale in 2006 and we currently have over two thousand spaces available. The entire cemetery encompasses approximately seventy-five acres and still has spaces available in the original thirteen acres. Although some of our sections have been sold out we still have over six thousand spaces available. Here at Magnolia Cemetery we offer value and peace of mind by providing many preplanning options from traditional burial spaces, community mausoleum crypts, private mausoleums, monuments and all kinds of other memorials, prepaid opening and closing service fees and final inscriptions. We offer zero interest financing for twenty-four months. We are a Non Profit Perpetual Care Cemetery serving Southeast Texas for over one hundred twenty years. When you compare our prices to other cemeteries of our stature you can see the difference. We offer tours of this historical property.